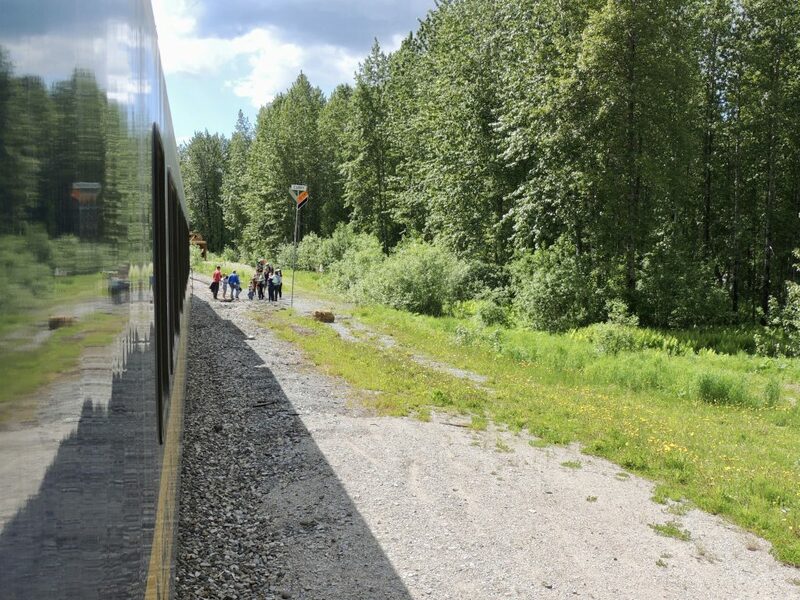 Riding the Alaska Railroad’s historic Hurricane Turn Train is an authentic Alaskan experience quite unlike anything else in the state. 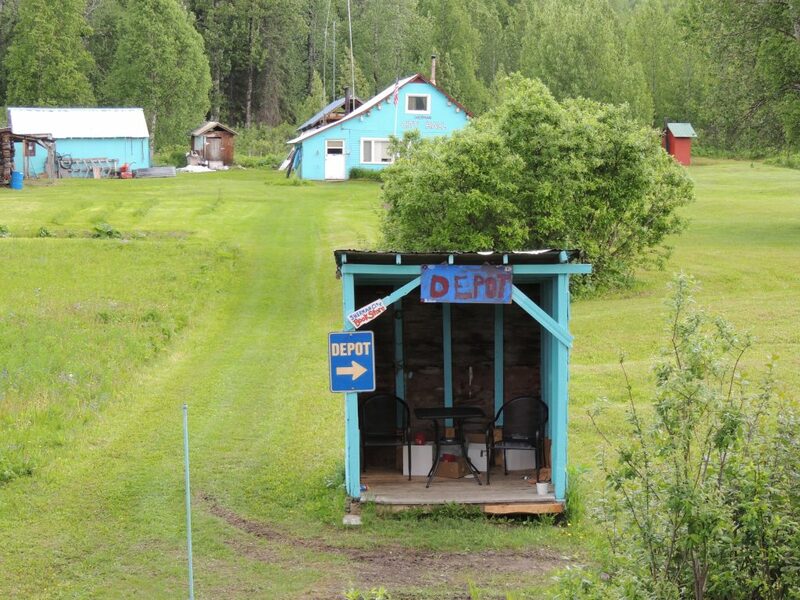 Departing from Talkeetna, about 130 miles south of the entrance to Denali National Park, the Hurricane Turn leaves modernity behind as it travels 57 miles northward through the backcountry to the ghost town of Hurricane. 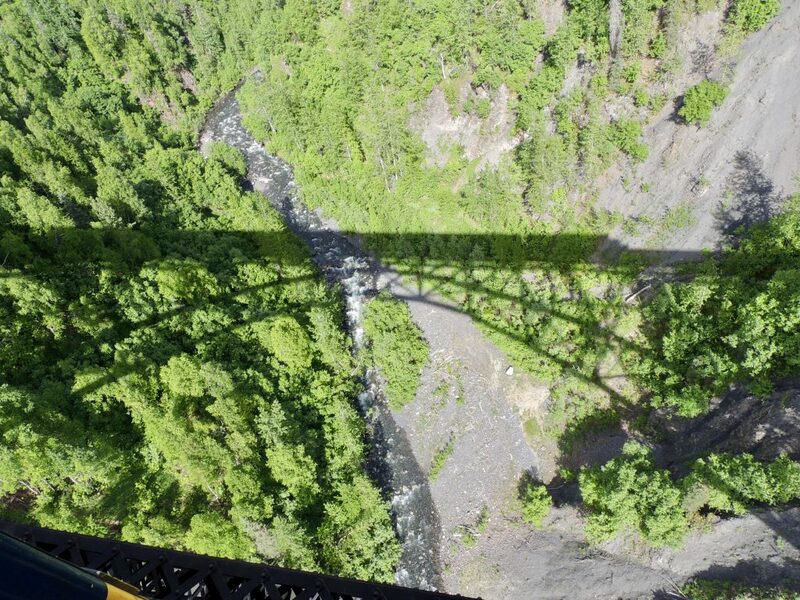 There–after pausing for a while on the 918 foot long steel arch bridge across Hurricane Gulch, where the creek flows swiftly 296 feet below–it reverses its course and returns to Talkeetna, arriving about 6 1/2 hours after it left. 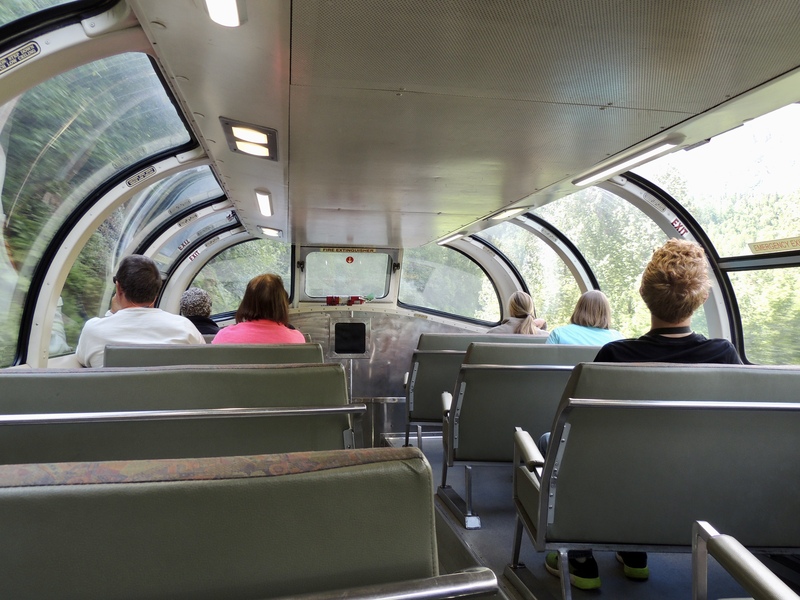 The Hurricane Turn attracts its share of tourists, although most visitors either don’t know about the train or don’t make the side trip to Talkeetna. But what makes the Hurricane truly unique is its flagstop service–the last of its kind in North America. Five days a week during summer, local passengers take advantage of this service to get on or off the train anywhere along its route for access to their homes or to remote cabins, campsites, hunting and fishing. To get on, you simply hang or wave a flag–any kind will do, from a windsock to an old t-shirt–and the engineer will stop the train to let you board. To get off, you just tell the conductor where you’d like to stop. To get the train to stop and pick you up, just hang out a flag. The four-wheeler and sled are handy for hauling supplies between your cabin and the train. For the 40 or so Alaskans who live off the grid on the Hurricane’s route, the railroad is their only transportation link with the rest of the world. Their address is simply a milepost number on the Alaska Railroad’s main line from Fairbanks to Seward, although addresses aren’t really necessary: the train’s crew and most of the locals know each resident by name, and are more likely to simply refer to “Mary’s house”. When residents need food or supplies, they can have them delivered on the train, which has brought livestock and even a dogsled and team of dogs into the backcountry at various times in the past. And the train’s crew watches out for the residents, too: if something doesn’t seem quite right at one of the stops, the conductor will either radio in for someone to come out for a “well check”, or he’ll go knock on their door himself. The crew of the Hurricane Turn is another part of what makes this train such a one-of-a-kind experience. They’re a tight-knit group, and several of them have worked this route for many years. Their boss, Conductor Warren Redfearn, is a local icon, having been featured several times on television and in print. 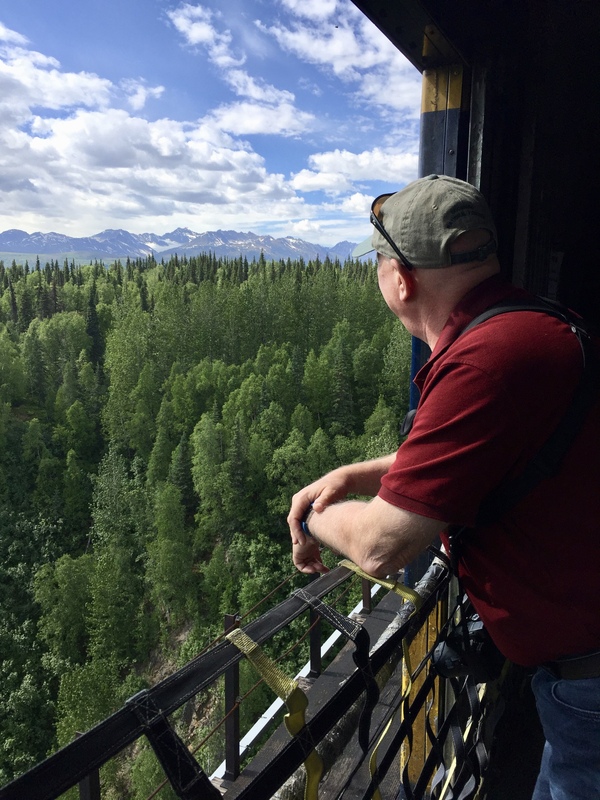 He has been riding the Alaska Railroad since he was nine years old, and has worked on it for more than four decades. 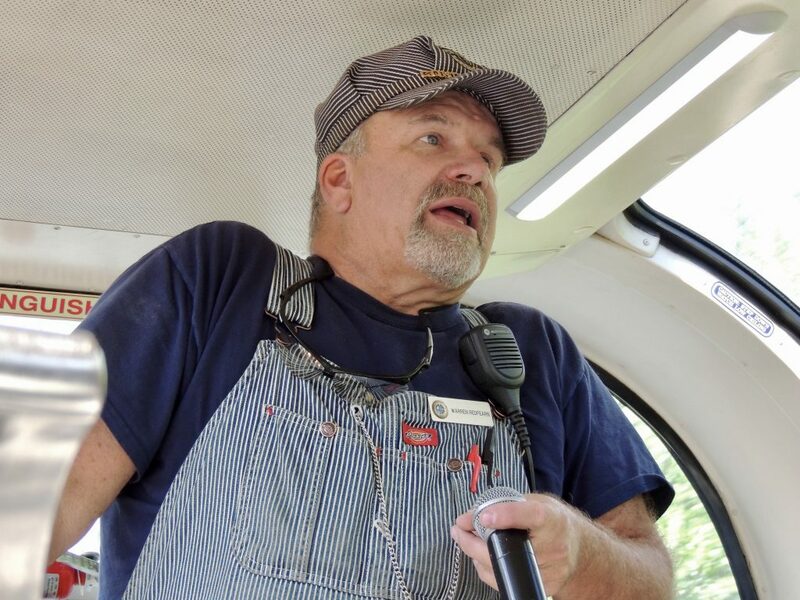 With his striped overalls, matching railroad cap and gold pocket watch, Conductor Warren looks exactly as one imagines a genuine train conductor should. And he is a man who unabashedly loves his job: walking through the passenger cars with a wireless microphone, he enthusiastically shares stories about the Hurricane and its history, notes points of interest, identifies wildlife along the tracks, schmoozes with the adult passengers, and awes the little ones with his artistic ticket-punching (“way better than the conductor in The Polar Express“) and special mementoes of their trip. 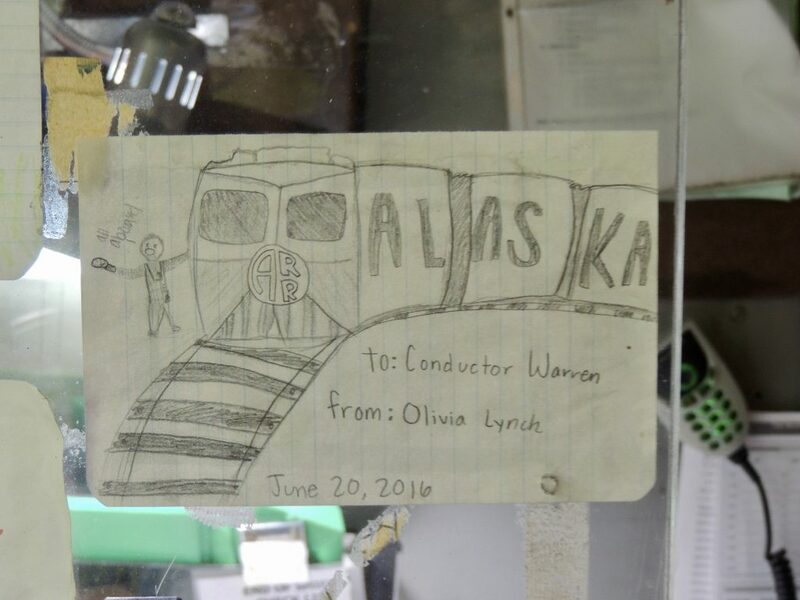 When we rode the Hurricane Turn on a Thursday in June 2017, we were joined by a young woman who works as an interpretive guide on one of the Alaska Railroad’s other lines. She told us of an idyllic backwoods picnic area near the tracks at Twin Bridges (milepost 270) where she had always dreamed of camping, and today she was getting her wish. 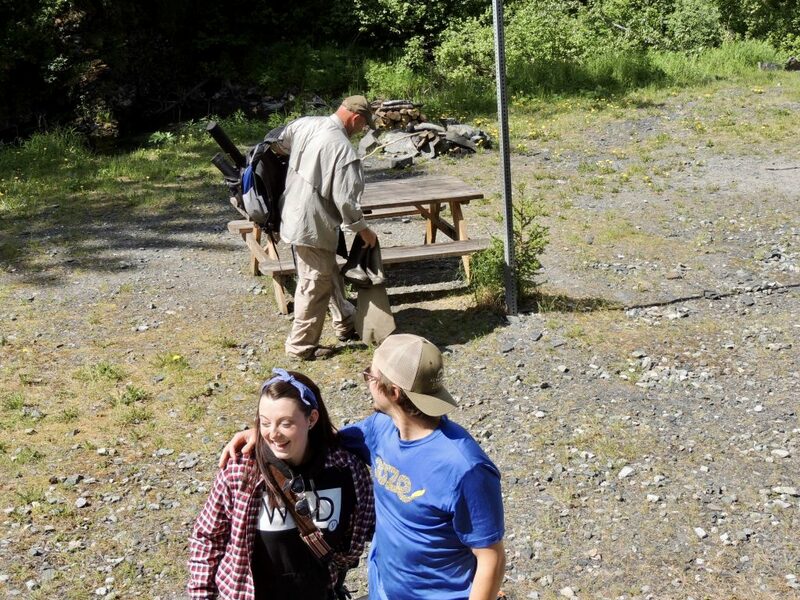 She could barely contain her excitement as the train dropped off her and her boyfriend on the outbound journey; when we passed by again on our return to Talkeetna, we saw their tent and hammock perched high above the creek about a hundred yards away. Once the train departed, they would be completely alone in the Alaskan woods until the Hurricane’s return the following afternoon. One of the other passengers was traveling to visit her friend, children’s book author and illustrator Shannon Cartwright. Cartwright, who has illustrated more than one million books in print, has lived in Alaska for more than 25 years, mostly here in the bush, and says she and her husband and two dogs (one of which came with her on the train) thrive on living a simple life off the grid. 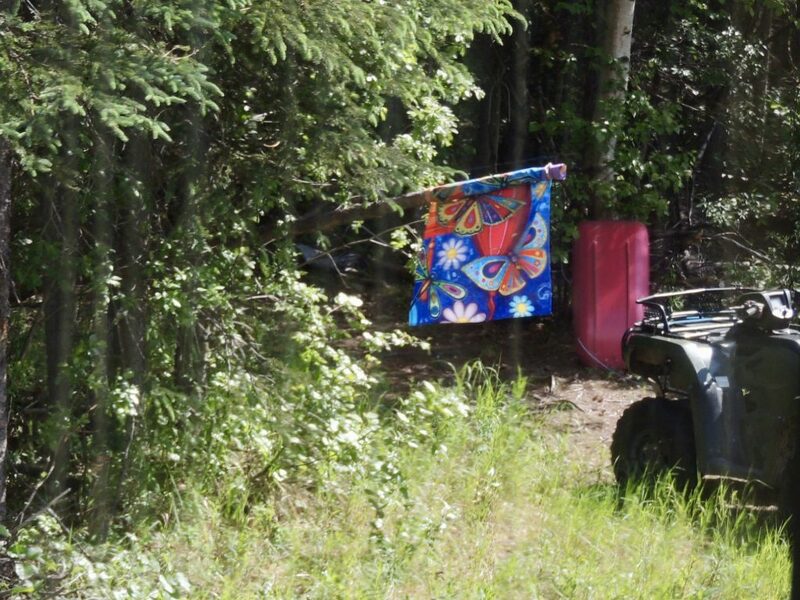 On this day, Cartwright hung out her flag along the tracks, and the train stopped to pick her up on its way to Hurricane; then on our return journey, she and her friend got off and went up the hill to Cartwright’s backcountry cabin. The train made yet another stop in the tiny town of Sherman, Alaska, to pick up its entire population of two: Clyde and Mary Lovel, who moved to Alaska from Missouri and established Sherman as their homestead in the early 1960s. Their bright turquoise home, which doubles as Sherman City Hall, is an unmistakable sight. Mary has authored three books so far, which she sells online as well as out of a tiny shack along the tracks that serves as a combination train depot and bookstore. 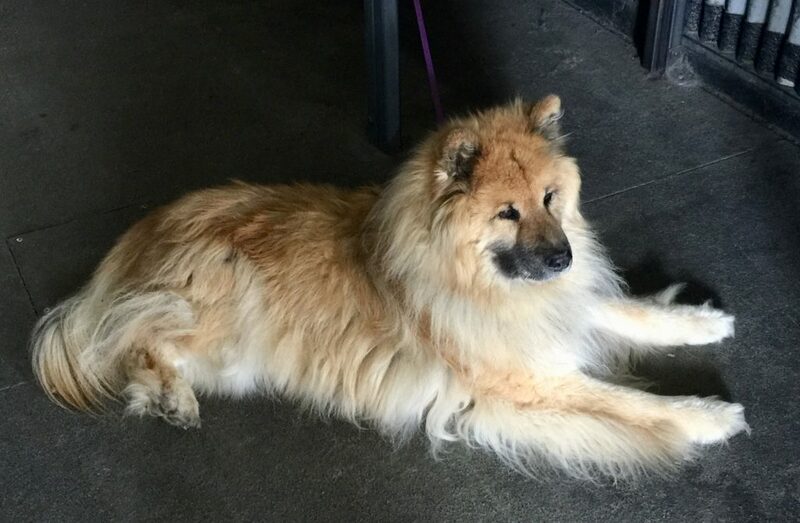 She and Clyde were on their way into Talkeetna to celebrate their 63rd wedding anniversary with dinner at a local restaurant. Wildlife abounds along the Hurricane’s route. The engineers up front watch for animals near the tracks, and radio back to Conductor Warren when they spot something. The Hurricane Turn is the only scheduled service on the Alaska Railroad on which the conductor has the authority to stop the train and back it up, aligning the huge open side doors of the baggage car to give passengers with cameras a clear shot for their photos. 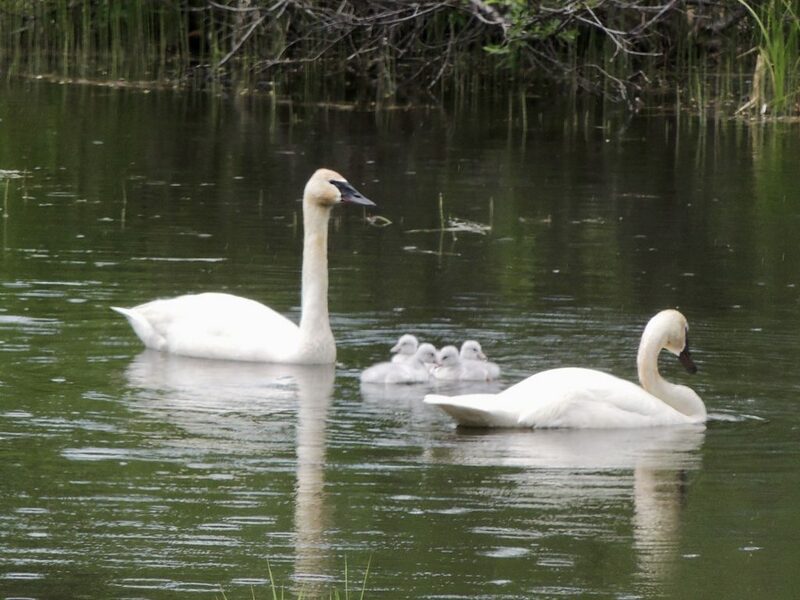 On our journey, we spotted a mating pair of trumpeter swans swimming with their four newly-hatched cygnets (earlier in the week, the train crew had been watching the mother sitting on the nest nearby), as well as a cow moose running through the marshy area near the tracks. (Be sure to watch our video, at the top of this page!) Warren said that on the previous Monday, they had seen a black bear with her two cubs up in a tree alongside the train, but we weren’t quite that lucky. If you’re not a photographer, there are also great views (including a glimpse of Denali) out the train’s large picture windows and from the elevated dome car. And there is yet another difference that makes the Hurricane Turn unique: it’s the only train on which you can bring your own alcohol, and in fact the crew encourages you to do so, along with snacks or a picnic lunch. A group of passengers that included at least one knowledgeable local took full advantage of this, with a spread of cheese, crackers, smoked Alaskan salmon, dips, fruit and vegetables–along with bottles of wine and vodka with cranberry juice–that would have been perfectly at home at a cocktail party. Indeed, the Hurricane would be even more of a blast with a group of friends! Who would like to go back with us? Thanks for the ride. It was fun to see what you were seeing.